Halloween decorations don’t have to be difficult, and kids love to join in the fun. And seriously, I won’t tell if you decide to pick up the crayons or colored pencils and color along! You can easily print out my drawings and color them in. 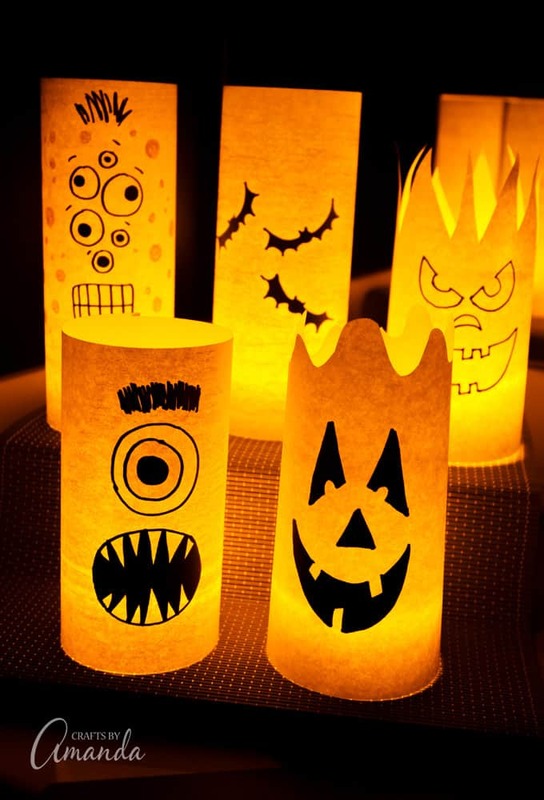 By day they are colorful shelf or window decorations, but by night they are spooky paper Halloween luminaries! Cute huh?! 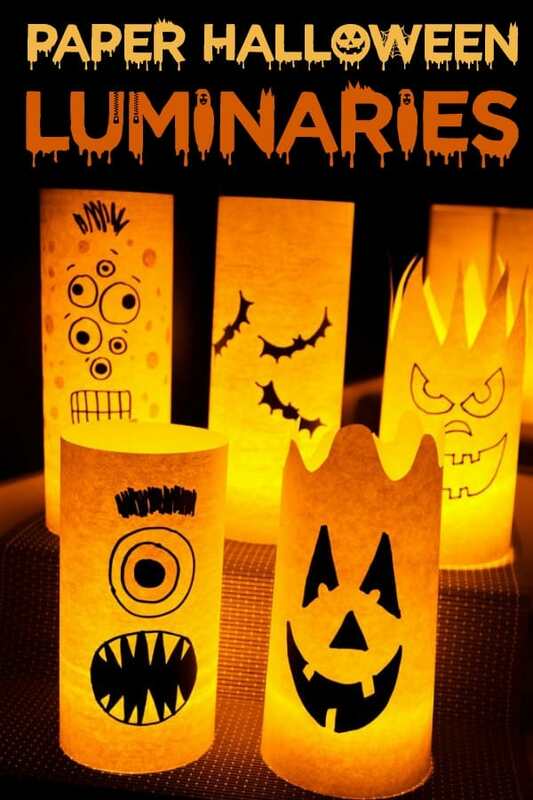 And these paper luminaries are one of the simplest of the easy crafts for kids on this blog. All you have to do is print out my drawings, color them in and tape them into a cylinder. 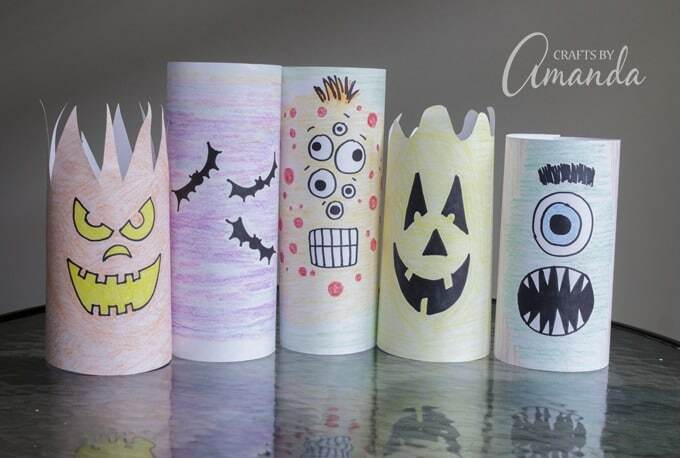 Your kids may love making these fun twirling paper monsters as well! Hang them up and watch them twirl in the wind. Of course if the kids (or you) prefer, you can draw your own designs too! If you decide to do that with your paper luminaries, be sure to use a black marker for the main design. As you can see from the animation above, the color from the crayons is lost when the lights go off. The only crayon color still visible is red. 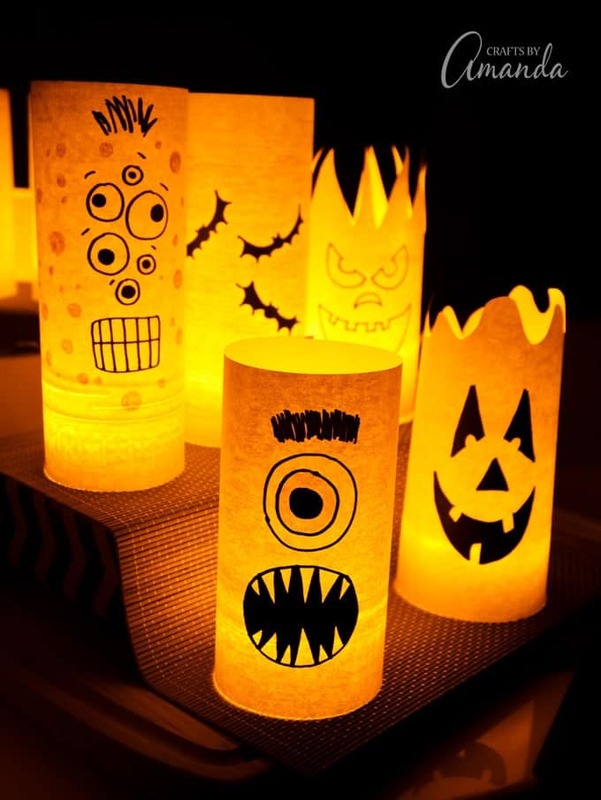 During the day these paper Halloween designs are all colorful and cute, but by night they light up the place! So as I said, these printable luminaries are pretty simple really. And it’s a great way to spend an hour or so coloring and creating. If you draw your own designs, use an 8.5″ x 11″ sheet of printer paper placed horizontally. Draw your design in the center. Remember you will roll the paper into a cylinder and if your design is too wide the whole thing won’t be seen at the front of your luminary. Print each pattern on white paper. Color in with crayons or pencils. Roll paper into cylinder and tape closed. Turn on tea light and place inside glass jar. Place paper luminary over the jar. 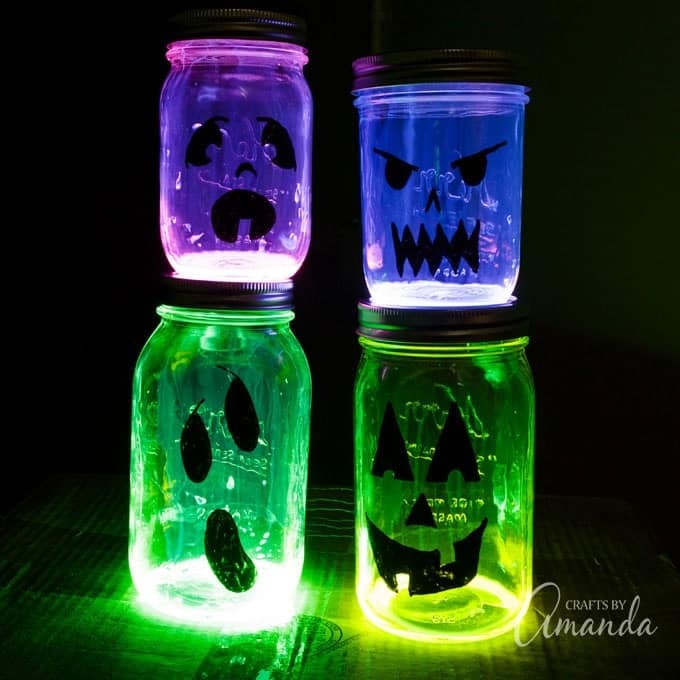 My glowing jack o lantern jars are a great way to light up your sidewalk at night! 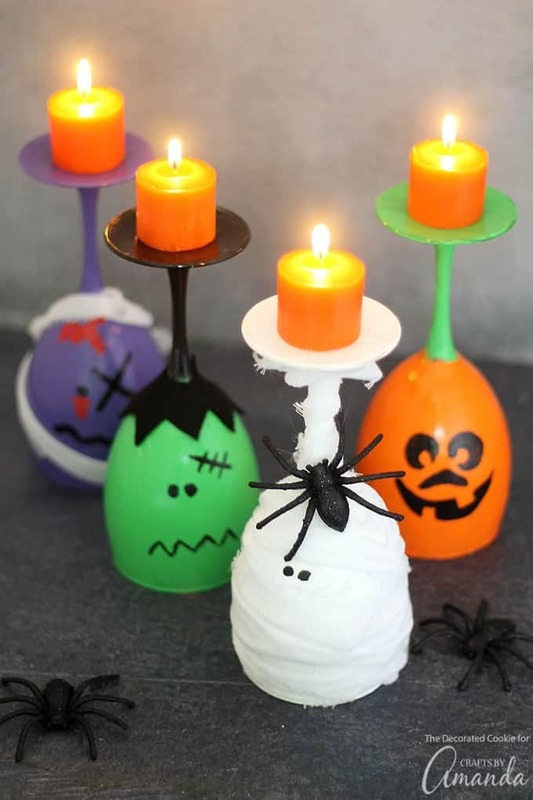 These Halloween wine glass candle holders are a super cute and spooky way to decorate your house for the holiday! And if you’re looking for Halloween party ideas you are in luck, there’s a ton on that post. 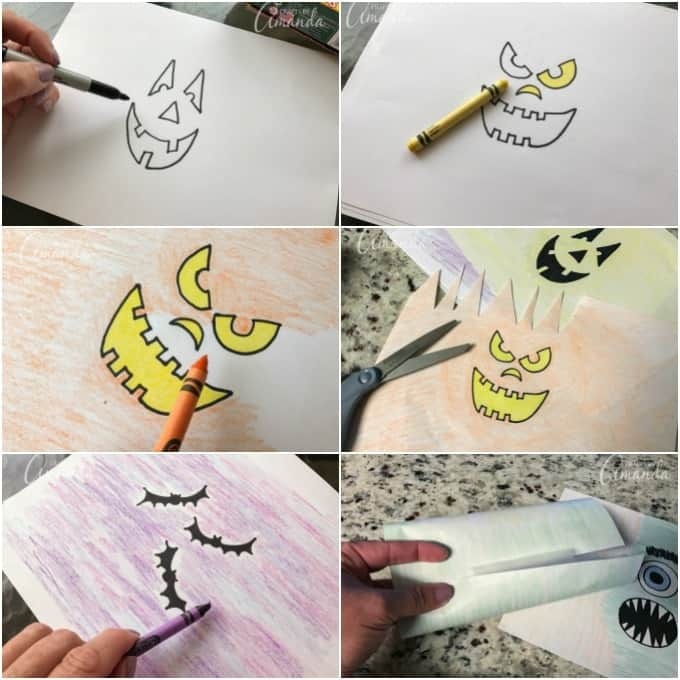 If you love Halloween, try these monster paper bag puppets for some fall afternoon fun! My 5 yr old grandson had fun this weekend making these luminaries. Thank you for sharing the patterns and instructions. WE colored them together. He was delighted to show his parents what he made. How fun! I’m so glad he had a fun time making these :) Thanks for sharing, Deb! These are so cute!! I’m going to make them with my grandkids at our Halloween party! Thanks so much for sharing all of your creativity! Lovely! These Halloween lights are awesome, they’re easy to make and they look great.